I feel like it takes a certain type of person to read and enjoy Shakespeare’s plays for entertainment in their own time, so I don’t blame you for having a contentious relationship with his work. 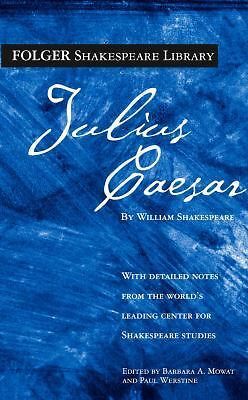 I worry about people’s fixation on one scene in the play, as you cited with the recent version being performed, and the fact that they misunderstand that the tragedy IS the death of Caesar which brings about the end of Rome as a republic and transfers it into an empire. I have to commend you for continuing to give the Bard a chance, though it may feel masochistic at times. Great review! My 9th grade English teacher was a Shakespeare buff, and he made us ALL memorize and recite Mark Antony’s soliloquy. That wasn’t a fun day. I remember reading this in High School, and I loved act 1 but got lost and disappointed with act 2. There’s this vine I re-blog on Tumblr every Ides of March about Caesar being stabbed, and everyone in the senate was told in a group chat to bring their knives on the ides of March, and someone accidentally added Caesar to the chat XD. I also remember seeing that one line that the Fault in our Stars is from, and I may or may not have circled it in my textbook…I loved learning the full extent of what John Green was referencing – that the stars are fate or the cards that life has dealt us. The play makes the point that even if we’re dealt bad cards, it doesn’t matter because we control our own destinies. But TFIOS follows two kids with cancer, who can’t control their own fates. I’m so sorry you didn’t like Hamlet, it’s my favorite Shakespeare play XD. Well, to each their own I suppose. I think Julius Caesar act 1 might be my second favorite, but my third is A Midsummer Night’s Dream. It’s a comedy, so if you want to read a Shakespeare play with a happy ending, it might be the next place to go. Although, full disclosure, it has some weird stuff go down, which I’ve found strikes some people as confusing and others (like me) hilarious in a “What the heck is going on” way.